The last film of the year 2018, Simmba is doing amazing box office collection at the box office. Bollywood actor Ranveer Singh starrer film has a collection of around 190 crores in 10 days only. Now the film is looking for to enter 200 crore club. Ranveer Singh was seen in the role of Simmba, a cop like Singham. People loved the way Ranveer Singh played the role of Simmba. Now after the huge collection of Simmba, finally the team of Simmba came to attend the grand success part of the film. 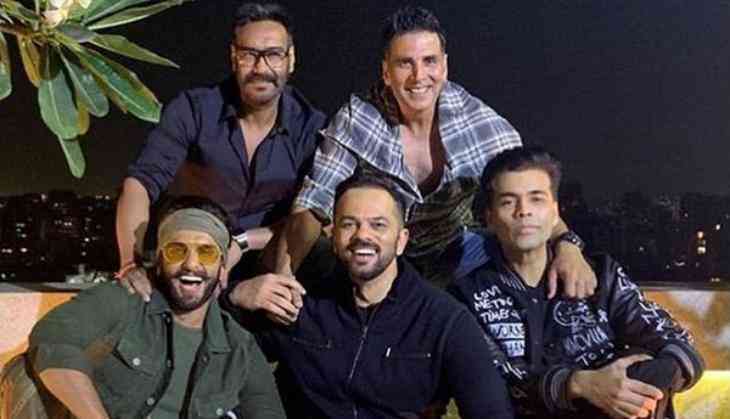 In this party, we all saw Ranveer Singh, Deepika Padukone, Ajay Devgn, Akshay Kumar, Sara Ali Khan, Kajol, Sonu Sood, Karan Johar, Rohit Shetty and others. The success party of the film was held in Mumbai where all the actors came to spend time together. The intersting thing is that Ajay Devgn and Akshay Kumar who once be called as rivals were also seen together in the party. Not just them but Deepika Padukone the newlywed wife of Ranveer Singh were also seen giving blessings to the trio, Ranveer, Rohit and Karan.